Zombies. Kill 'em, burn 'em, spray 'em with explosive firepower. It doesn't matter, they just keep on shambling. TV shows and video games have handed us just about every zombie apocalypse scenario in the Big Bag 'O Dramatic Tricks, and the solution is almost always the same: get to killing. Breach & Clear: Deadline does something different, and it's a better game for it. Breach & Clear: Deadline drops your squad off in a post-apocalyptic world where worms have turned lots of people into zombies. Yes, worms. Brainstem eating worms. The resulting chaos turned everything into shambles, and you're here to save the day. Or is it eke out a living? The story isn't exactly Breach & Clear: Deadline's strong point, but you're probably not here for a fairytale. You're here for the zombie killing, in which case, Breach & Clear: Deadline's got you covered. 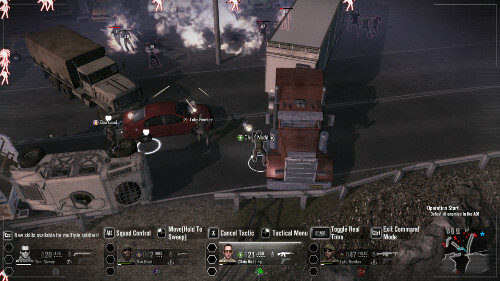 Breach & Clear: Deadline gives you two modes to play with: tactical and action. 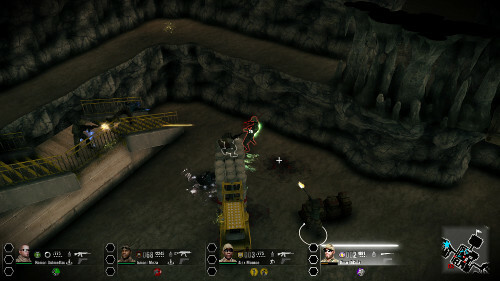 Action is used for moving between set pieces, picking up scrap, gathering dropped items or weaponry, and so on. You can also switch to action mode during tactical mode in case you're in the mood to hoof it and kill off some zombies with good old fashioned manual gunfire. You'll use it more often than you think, and it provides a great foil for the slow and steady strategy of the main mode. Most of your time will be spent in time-paused tactical mode, and this is where Breach & Clear: Deadline excels. When things get strategic, the camera will switch to an overhead view and the action will pause. You can pan around the area to get a look at your surroundings, taking note of zombie positions and places where you can take cover. 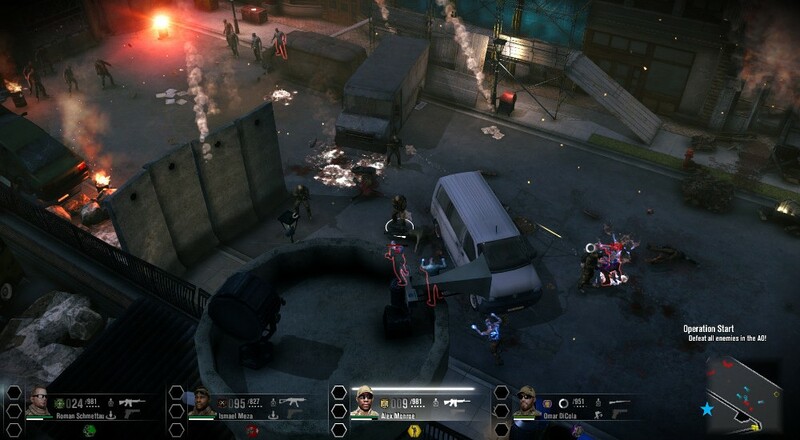 Move each squad member to a location where they have a clear line of fire, choose any special items or tactical actions to perform, then play god as you manually push time forward and watch everything play out in all its bloody glory. You can pause and readjust anytime you like, which is especially useful when those worm-infested shamblers surprise you by walking up from your flanks. Regroup! Regroup! The manual time control is an amazing feature and gives you full control over how the tactical sections pan out. You won't feel any kind of pressure to choose your next move, allowing you the luxury of surfing menus and tweaking deployments until you're ready to go. There's no rewind button, only incremental forward motions, so please do take all the time you need. Time frozen zombies aren't going anywhere, and any mistakes you make tend to hurt. Bad. In addition to standing and shooting or taking cover, squad members have unique abilities you can deploy to give you a slight edge. Scout, intelligence expert, medic, and explosives expert give you a wide range of abilities to choose from. Better still, those abilities unlock in branching skill trees, offering up even more customization for your zombie slaying pleasure. You can even pull open your inventory and toss out a flashbang grenade when things are looking especially grim. Breach & Clear: Deadline gives you a lot of tools to upgrade, equip and augment. Step into the safehouse, walk up to the workbench and start tinkering.